In 2015, Jessica of Discover Albia released an update to the original lemons with fixes to reduce confusion. Although lemons are viewed by some to be just as much a staple food as carrots, there are no lemons in C2's Albia or in the C3 Shee Ark. 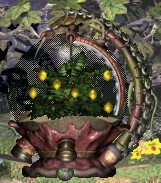 In Docking Station, the tiny lemon tree is contained in the Lemon Pod in the upper level of the Norn Meso. When the pod is pushed, by a Creature or the Hand, lemons are harvested and dispensed for your Creatures to eat. The lemons have medicinal properties and are a recommended food for sick Creatures. However, the healthy DS lemons can be dangerous to Toxic Norns, and should be avoided. Albian Lemon Beatle by Mannkind. This beetle eats lemons. Lemon Vendor by the SteerPike. Rotten Lemon by Ryan. Lemons way past their use-by/expiry date - they've even gone brown! Selector Lemon by Alexander Laemmle. Any creature eating the lemon becomes the selected Creature. It is particularly useful for selecting Grendels. Lemon Trellis by the C12DS team. The Lemon Trellis from C1 comes to the Docking Station. Mini Lemon Vendor by Ali. The vendor is mini-sized, not the lemons. Scurvy Fighting Lemon Pod by Malkin - adds a small amount of Vitamin C to the native DS lemons. This page was last modified on 8 October 2017, at 02:18.